Remote controlled roaming self balancing robot! 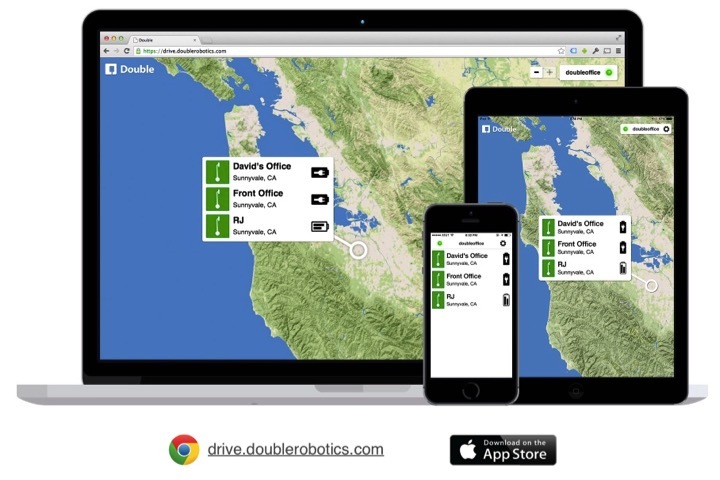 Your Double 2 Telepresence Robot puts you in the driving seat from wherever you may be in the world. You can roam about freely, talk to people, attend meetings, or just check out the space. The driving experience of the Double 2 is greatly enhanced with new features such as Lateral Stability Control that improves navigating over cables and carpets and other bumps on the floor and Power Drive that allows greater distances to be covered up to 80% faster. Your robot will liberate you from having to schedule a room with videoconference facilities because you can now sign-in and roam any time, which enables a revolutionary new level of interaction with people. There is also no need now to call or ask someone to set up a laptop for video chat. The "brain power" as well as forward camera, down camera and standard microphone/speakers is provided by your own Apple iPad or iPad Air (recommended). The robot once fully charged (2-3 hours) is available for use for 6-8 hours. It can turn on its own axis and move around forwards and backwards at a normal persons walking pace. It is suited for indoor operation on flat floor surfaces (not steps). The robot includes a charger, allen key, and wide angle lens. An audio kit is available to amplify the iPAD speaker and provide a directional microphone. It is suited for more noisy environments such as conferences, classrooms and large meetings. The Video Kit improves on the iPAD camera by providing a high definition wide angle lens with more video and photo taking clarity and area. The 150 degree wide-angle lens provides 70% move view! The 5 megapixels also takes higher resolution photos than the standard iPAD camera. The charging dock accommodates the standard charger, and is used to dock and charge the robot remotely. The user drives the robot into or out of the dock. The dock ensures that the robot is always on and charged and available for action. The Audio and Video accessories are also backwards compatible with the Double 1 and can be successfully used to enhance the first generation robot. Driving your Double is easy and fun !